Yes, I know I said there would be no more Nandi videos. I was wrong. I was delusional. I have no idea how many more Nandi videos there will be. She’s too cute. She does too many adorable and fascinating things. So as long as the Reid Park Zookeepers keep on putting them out, and I keep on finding them, I suppose I will keep on posting them. They make me smile. And when they come to my own inbox I always have to watch them repeatedly. This entry was posted in Nature, videos and tagged baby elephant, Elephants, Nandi, nature video on November 30, 2014 by Karen Hancock. Really. I mean it. This is the last one! In fact, I had no idea I was going to post so many elephant videos, but they’re all just so darned cute. And this one, which includes the entire herd, is not only really well done, but just shows a lot of cool stuff. Like Mabu LYING DOWN in the mud wallow. Wow. This entry was posted in Nature, videos and tagged animals, baby elephant, nature video on November 18, 2014 by Karen Hancock. Yes, it’s yet another baby elephant video, but this one is not of our Nandi at the Reid Park Zoo. Instead, it is of an Indian elephant baby at the Zurich zoo, who falls on his back trying to climb onto a ledge. The adults immediately rush to his aid. I was blown away by their speed and the way they worked together…. And the more I’ve watched this the more I think neither of the two was even the baby’s mom, but rather the “aunties.” Mom seems to come up afterward and is the one he ends up standing under when it’s all over. 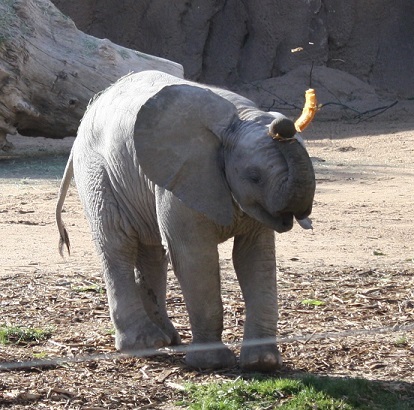 This entry was posted in Nature, videos and tagged animals, baby elephant, nature video on November 16, 2014 by Karen Hancock. This entry was posted in Nature, videos and tagged animals, Elephants, nature video on October 19, 2014 by Karen Hancock. This entry was posted in Nature, videos and tagged animals, Nature, nature video on October 5, 2014 by Karen Hancock. This entry was posted in Nature, videos and tagged baby elephant, Elephants, Nature, nature video on September 20, 2014 by Karen Hancock.